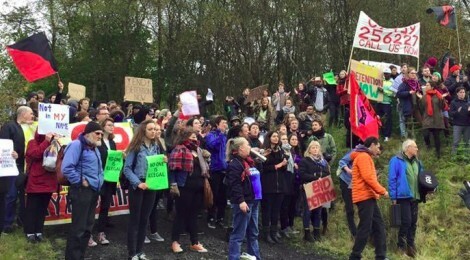 ‘We Will Rise’ held a protest at Dungavel Detention Centre and sent us the follow report. We Will Rise held a powerful demonstration outside Dungavel Detention Centre on Sunday 25th October to call for it to be shutdown. Over 400 protestors including ex-detainees of Dungavel surrounded the notorious centre, chanting, waving colourful flags and holding banners with messages of solidarity to communicate with detainees inside and send the message that Dungavel’s time is up. As the protest gathered momentum, detainees made it outside and occupied the courtyard, where they waved to protesters and made peace signs. Other detainees were locked inside their rooms from where they waved with their arms outstretched from the windows. Guards attempted to drown out the protest, using lawnmowers which couldn’t match the energy and chanting of protesters. Dungavel is an immigration centre 50 miles south of Glasgow, holding 249 detainees, and has attracted controversy since its creation in 2001. In March this year, hunger strikes broke out at Dungavel involving 70 detainees protesting against their unfair and indefinite detention and their cramped living conditions. In the last few months there have been two attempted suicides. At the beginning of March, The All Party Parliamentary Group on Refugees reported that detaining immigrants was a substantial cost to taxpayers and also caused detainees to have mental health issues. We Will Rise calls for Dungavel to be shutdown. It is inhumane, racist and unsafe. We need open borders, end imperialist wars that are forcing people from their homes and welcome all who make the journey to live here in search of a better life. Scapegoating of immigrants has to stop. No one should be locked up due to their immigration status. We are working in solidarity with groups fighting for justice, freedom and anti-racism. There is a growing momentum in the campaign to end detention. Movement for Justice have been holding inspirational, inclusive protests outside Yarls Wood and Harmondsworth. We will be protesting outside Dungavel again soon, so spread the word, stay updated through our social media and email us if you want to get involved.